What pick slots have the winners had over the course of this league? I'm sure someone will spend the time going through it. I might look. I've been in the league i think every year except 1. Can we get people to reach out to the remaining players in the league to come touch base that they're in? I have a great pick number but I'm also surrounded by good drafters. 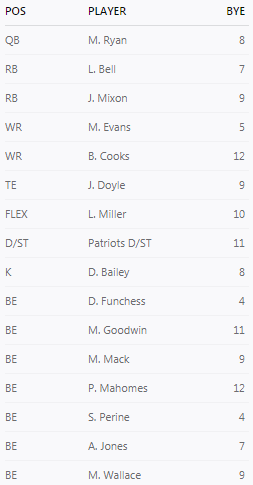 10 team league, standard everything besides .5 PPR. Who are you targeting at picks 10 & 11? edit: I was think picks 11 and 12. For 10-11 basically whoever listed that I liked and byes made sense based off other targets later. Last edited by Hulky; 08-20-2018 at 03:45 PM.